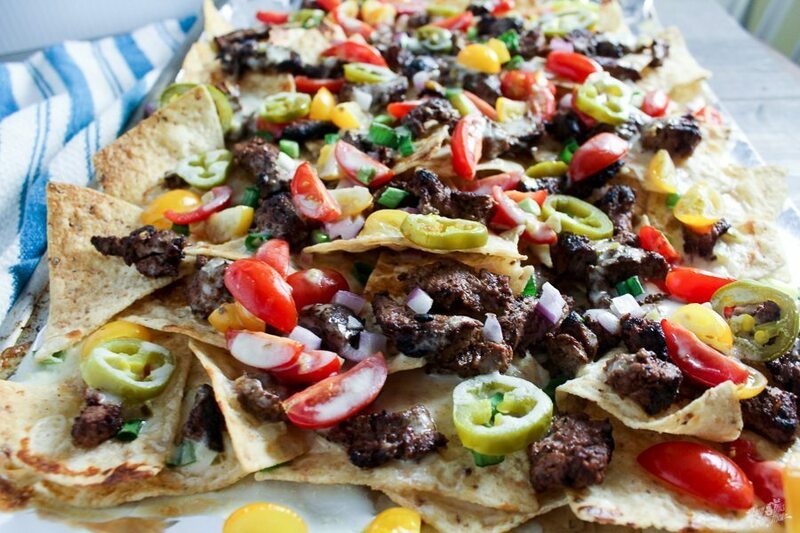 Zesty Marinated Steak Nachos are a mouthful of wonderful! These nachos are topped with tender and flavorful marinated steak. Yes, yes, yes. That’s all I need to know. 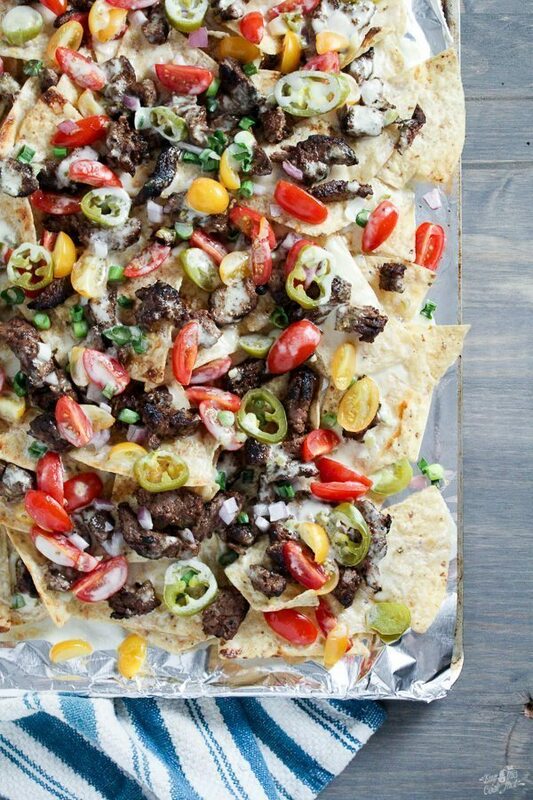 Load these steak nachos up with cheese and all of your favorite toppings for a filling snack or dinner. The secret to this spicy treat is the zesty marinade we used on our steak. 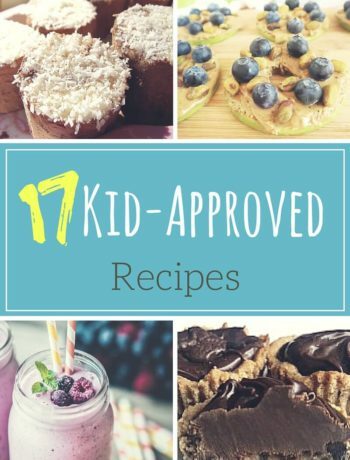 You probably have all of the ingredients on hand. Isn’t it crazy how the BEST meals are sometimes the most simple. I mean, steak + nachos = excellent! You could certainly use leftover steak for this easy creation. Or, you can take the tastier route and use our easy marinade. 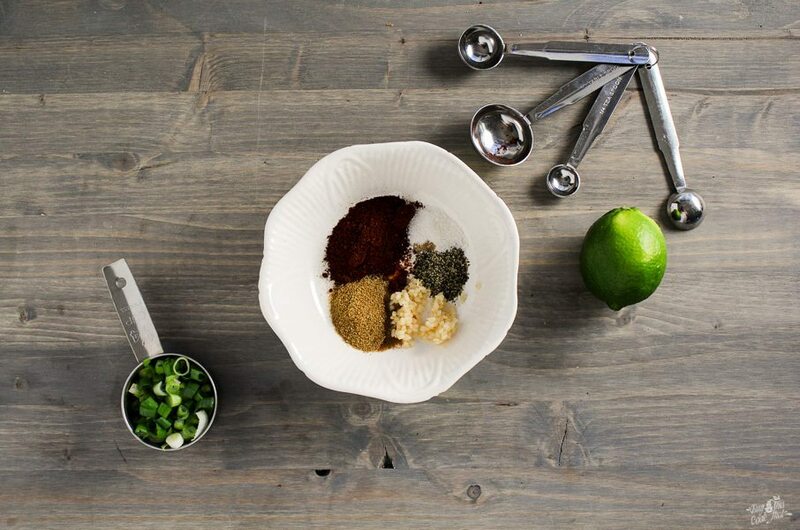 Chili powder, cumin and a few other spices are the base for our marinated steak nachos. Stir in some chopped green onions, minced garlic, fresh lime juice and olive oil. 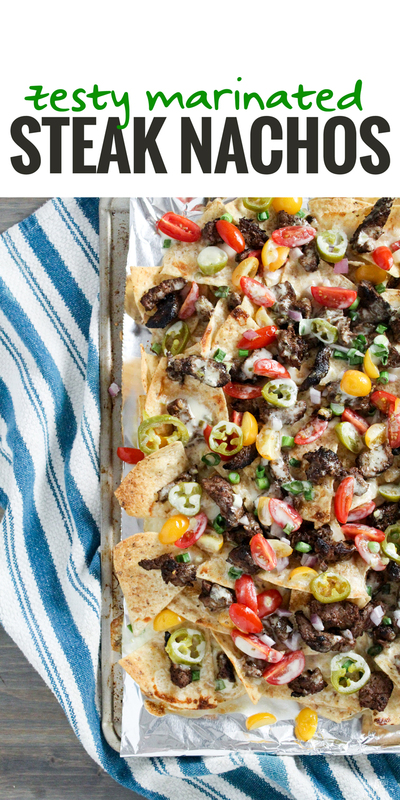 You are on your way to a pan full of Zesty Marinated Steak Nachos. 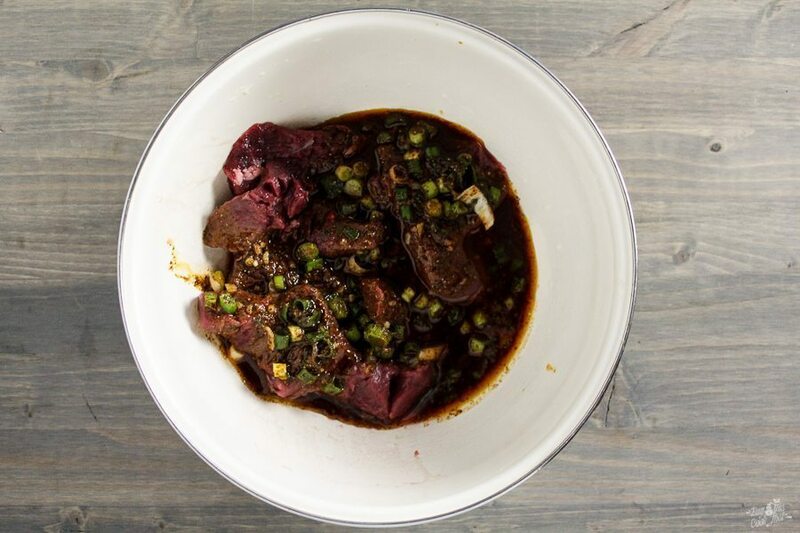 Get the complete marinade recipe at the end of this post. Love Tex-Mex? Try our Tex-Mex Macaroni recipe here. We used an inexpensive cut of beef. The marinade will make it tender and tasty. Plus the cooking technique. Our tip: start with a smoking hot cast iron skillet. I mean SMOKING hot. Shake the excess marinade off the pieces of steak. Then sear one side of the steak for about 3 minutes. Do not overcrowd the pan; work in small batches. 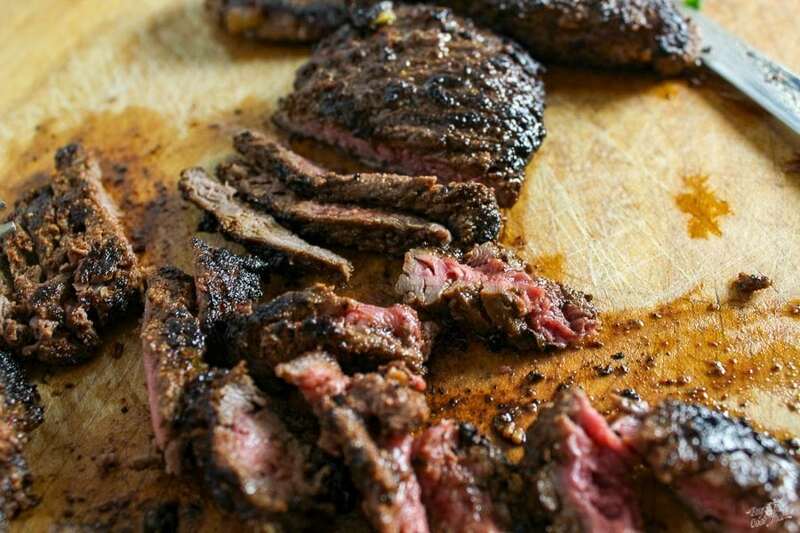 This marinated steak is also excellent in tacos, quesadillas or fajitas. Flip and sear the other side of the marinated steak for 2 to 3 minutes. Transfer to a plate, cover with foil. Let the meat rest for 15 minutes. This is soooo important. If you slice the steak too soon, the juices will run out…you don’t want that. Resting the meat allows all of the juices to run and hide…back inside the steak! Slice the steak into thin slices. Look. At. That. Perfect! Layer your favorite tortilla chips on a large baking sheet. We are in love with ours from Pampered Chef! Top with the steak pieces, cheese or cheese sauce and all the yummy toppings you want. Bake the Zesty Marinated Steak Nachos for a few minutes to crisp up the chips and warm all the toppings. Our choices? Chopped green onions, a few red onions, fresh halved cherry tomatoes, and pickled jalapenos. Or how about slices of green avocado, black olives and green chiles? Next time, I am going with some grilled green bell peppers and onions on my marinated Steak Nachos. 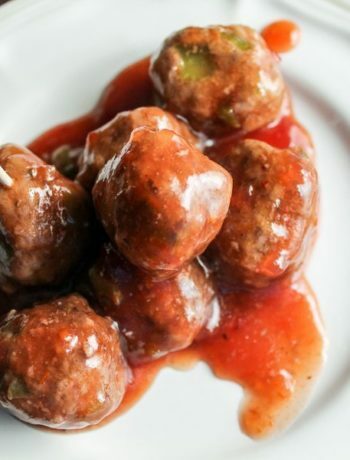 Looking for more addictive and savory meal ideas? 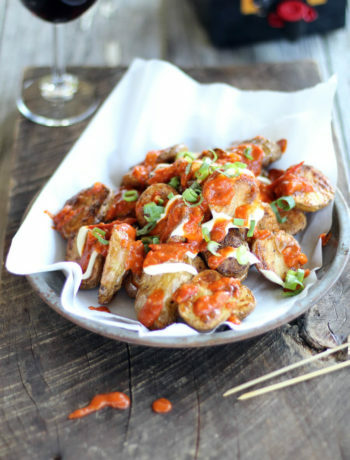 Try our Killer Ham Reubens or these Carolina Mustard Wings! A zesty and snack worthy recipe for nachos loaded with marinated and tender steak, jalapenos and fresh veggies. Make a double batch! Or your toppings of choice. In a medium sized bowl, combine 1/4 cup of olive oil, lime juice, lime zest, chili powder, cumin, salt and pepper. Stir in the minced garlic and 1/4 up of the chopped green onions. Cut the steak into serving sized pieces and place into the marinade. Coat all sides of the steak and press into the bottom of the bowl. Cover with foil or plastic wrap, and press the cover onto the top of the steak, sealing out all air. Refrigerate for atleast 1 hour to overnight. Heat a large cast iron skillet over high heat with 1 TB of olive oil. 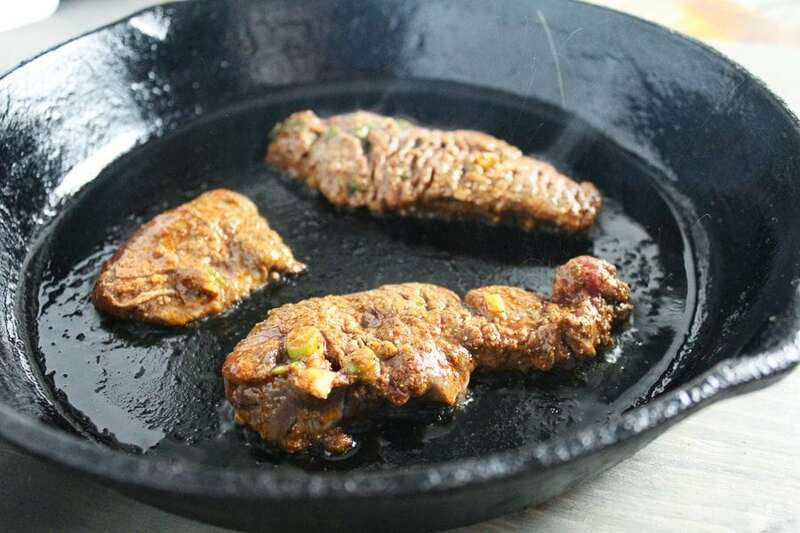 When the oil shimmers and the skillet begins to smoke, place a few pieces of the steak into the pan. Sear for 3 minutes, flip, and sear on the other side for 2-3 minutes. Continue this process working in small batches until all of the steak is cooked. Transfer the cooked steak to a plate; cover with foil and let rest 15 minutes. Slice the steak into small pieces. On a large baking sheet, arrange the tortilla chips in a single layer. Top evenly with the steak pieces, cheese, tomatoes, onions, and jalapenos. Place the baking sheet into the oven. Bake for 10-12 minutes until the chips are browned on the edges and all cheese is melted.